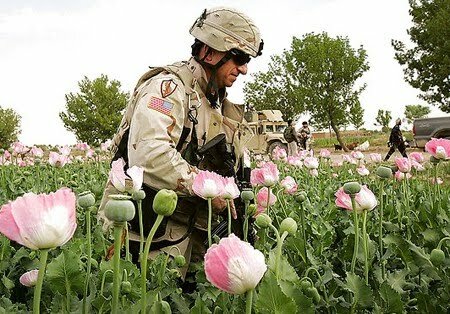 U.S. military withdrawal from Afghanistan would help solve the problem of drug abuse within the United States, since U.S. military involvement has led to a huge increase in the poppy, opium and heroin trade globally. In the past several decades, there has been a fetishism of foreign and domestic policy initiatives being called “War on X.” From a “war on drugs” to a “war on terror,” these militarily phrased blanket-policies have worked as an excuse to go guns blazing into sovereign lands and into the homes and lives of people, yet for all of their cost and expense to the lives and well-being of people, little real benefit is realized. Afghanistan is one such an example. While an invading force is slaying combatant and non-combatant alike, maneuvers in one “war” have proven to be costly for another war. The country of Afghanistan accounts for the vast majority of the world’s poppy crop. This plant is used in the production of opium and heroin and is the main cash crop in Afghanistan for struggling farmers in the country’s devastated and lawless agricultural sector. “Afghanistan [is] virtually the sole supplier of opium, accounting for 93 percent of global production” (“GlobalSecurity.org”). 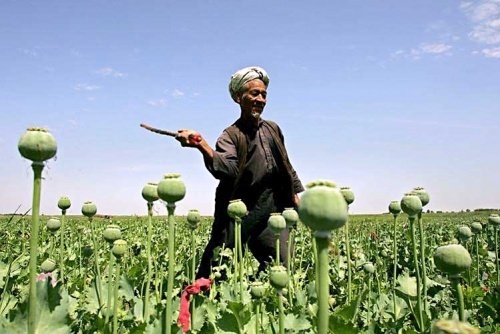 Since the 2001 United States intervention and the overthrow of the Taliban government of Mullah Mohammed Omar, “trends in opium poppy cultivation in Afghanistan have been on an upward trajectory […] accelerating quickly after the fall of the Taliban government” (“GlobalSecurity.org”). In the year 2000, the Taliban government banned the cultivation of poppy, and was wildly successful. The post-invasion government has failed to approach the efficiency of the Taliban-enforced campaign to eliminate poppy and opium production. In the year 1999, the output of opium from Afghanistan “was a world record for opium production” (“Opoids.com”). This same study by a reporter present in the country reported that “[in 1999], poppies grew on 12,600 acres of land in Nangarhar province. 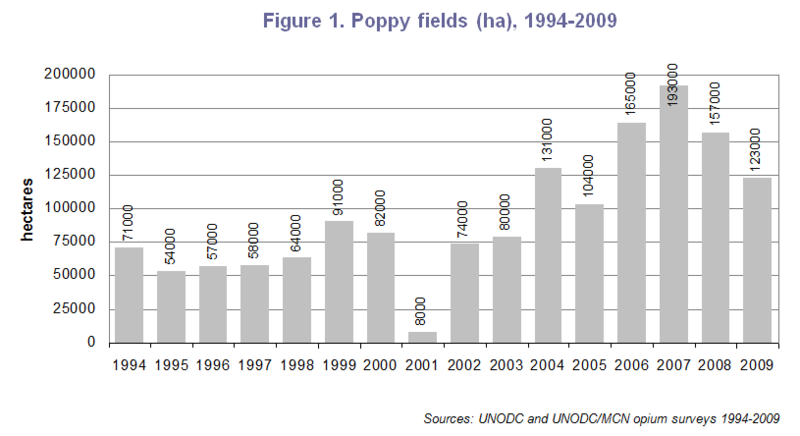 According to the U.N. survey, poppies were planted on only 17 acres there this season and all were destroyed by the Taliban” (“Opoids.com”). That same year, “U.N. drug control officers said the Taliban religious militia [had] nearly wiped out opium production in Afghanistan” (“Opoids.com”) This measure met with little resistance from most Afghan farmers, who preferred to grow food for sustenance and development rather than depending on cash crops that fueled the drug trade. International, unaffiliated, governmental and scholarly sources universally declared that “[o]pium production declined by more than 90 per cent in 2001” (Chossudovsky). 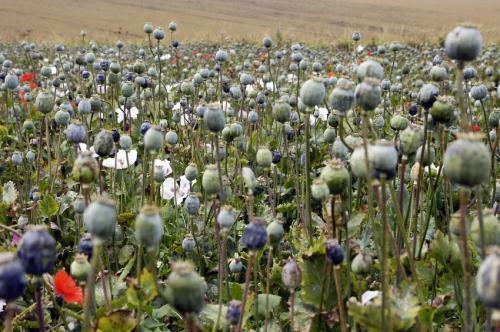 The Afghan people wanted to be rid of the poppy cultivation and opium manufacturing entirely. Mullah Amir Mohammed Haqqani, the Taliban’s top drug official, publically swore that poppy would be forever banned in the country (“Opoids.com”). The anti-poppy reform under the Taliban did not last long. “Since the US led invasion of Afghanistan in October 2001, the Golden Crescent opium trade has soared” (Chossudovsky). Reports concluded that since the invasion of Afghanistan, where almost all of the world’s supply originates, heroin is now more available and cheaper. “From October through December 2001, farmers started to replant poppy on an extensive basis.” (Chossudovsky). The newspaper The Age reported “a drop in price [of heroin] in the past year from $11,000 to $7500 an ounce,” and “found that opium production in Afghanistan, known as the Golden Crescent, shot up [in 2007] by 34% to 8200 tonnes” (Oakes). The Age article even went so far as to mention “[a]n explosion in opium production in Afghanistan” (Oakes) specifically. This enormous surge in the profitability and influence of the drug trade after the United States war in Afghanistan was not a mere coincidence, but rather a direct consequence of the conflict. “Immediately following the October 2001 invasion, opium markets were restored. Opium prices spiraled. By early 2002, the opium price (in dollars/kg) was almost 10 times higher than in 2000” (Chossudovsky). The production of opium and heroin has been steadily increasing since. The World Bank acknowledged that cultivation in Afghanistan increased “by 59 percent and production by 49 percent in 2006” (“Drug Industry Threatens to Derail Afghanistan’s State Building”). One major cause of such an upsurge is the toppling of a government that sought to destroy the drug industry in its native country, and also the destruction of infrastructure and agriculture caused by the invasion. Poverty has a direct effect on an Afghan civilian’s decision to grow poppy: “poorer households […] are much more dependent on opium for their livelihoods” (“Drug Industry Threatens to Derail Afghanistan’s State Building”). In the absence of a legitimate government to provide livelihoods, more Afghans are now dependant on the lethal cash crop. The threat of opium and heroin addiction is a very real threat to human life. In 2005, “the United Nations Office on Drugs and Crime estimated the total value of the global opium and heroin market to be valued at $65 billion, with about 11 million heroin users worldwide” (“GlobalSecurity.org”). Despite the high-falutin’ phrases of the Reagan, Bush and Clinton era towards the “War on Drugs,” the international drug trade has not been undermined in any way, shape or form. On the contrary, scholarly sources universally agree that the drug trade is better than ever. In 2010, MSNBC news reported on a government study which concluded the “rate of illegal drug use rose [in 2009] to the highest level in nearly a decade” (Hananel). Gil Kerlikowske, the director of the Office of National Drug Control Policy, was on record noting the disappointing “9 percent increase in drug use” (Hananel). The study was called one of the most comprehensive annual studies of drug use in the United States. Its numbers were shocking: “21.8 million Americans, or 8.7 percent of the population age 12 and older, reported using illegal drugs in 2009” (Hananel). Such a social ill is quite revealing in terms of the consequences of failing to curb the global drug trade, which results in the availability and cheapness of Afghan heroin and opium. This phenomenon is not limited to the United States. “Australian authorities and drug treatment experts have seen an increase in Australian cities of what appears to be Afghan ‘brown’ heroin” (Oakes). 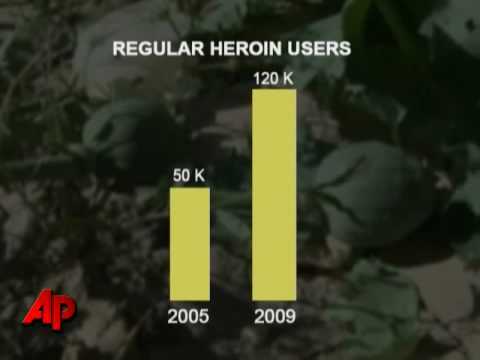 They also observed “a drop in the price of heroin […] and a sharp spike in the number of fatal overdoses (Oakes). The World Bank reported that efforts to “combat opium production in Afghanistan […] have failed to prevent the consolidation of the drugs trade in the hands of fewer powerful players with strong political connections (“Drug Industry Threatens to Derail Afghanistan’s State Building”). The strengthening of the heroin and opium trade worldwide has not only harmed the people of Afghanistan, but has poisoned the streets of the world with cheaper and more plentiful drugs. When it is an objective truth that the wars in Afghanistan has served to exacerbate the social conditions that have given rise to an increase in violence and drug trafficking, the best thing we can do in the short term to solve these problems is to stop making them worse. Intervention, like that of the United States in Afghanistan, creates the desperation and provides the markets for a burgeoning international drug trade. It provides its fuel. Therefore, if we are to extinguish the flames of an international market in addictive poisons, it is necessary that we stop dumping gasoline on it. 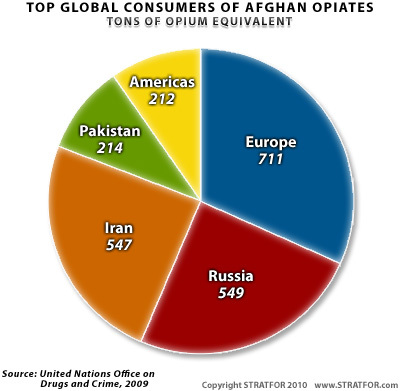 “Afghanistan Drug Market.” GlobalSecurity.org. 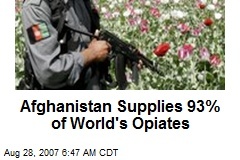 GlobalSecurity.org, 21 June 2010. .
“Afghanistan, Opium and the Taliban.” Opoids.com. BLTC Research, 15 Feb. 2001. Web. 2 May 2011. .
Chossudovsky, Michel. 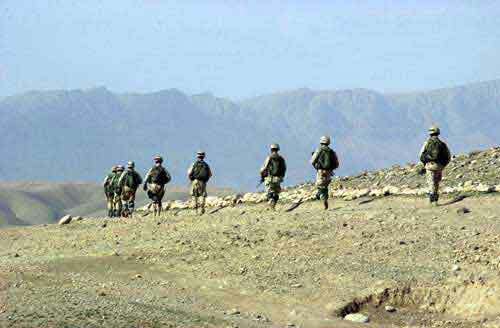 “The Spoils of War: Afghanistan’s Multibillion Dollar Heroin Trade.” Global Research. Centre for Research on Globalisation, 05 April 2004. .
Hananel, Sam. “Illegal drug use is higher than in nearly a decade, report finds.” MSNBC.com. MSNBC news, 19 Sept. 2010. .
Oakes, Dan. “Afghan heroin hits Melbourne streets.” The Age. The Age Company, 07 March 2008. . The World Bank. Drug Industry Threatens to Derail Afghanistan’s State Building. 2006.